On January 5, 2007, we were blessed with our second beautiful baby boy, Brayden Russell. Brayden was Mommy's boy and loved to cuddle close. He was a joy to all of us, especially his big brother Nathaniel. Brayden wanted to be wherever Nathaniel was and tried to do everything he did. When Daddy was home, the wrestling and tickling began. Brayden jumped right in with big brother and daddy, and you would never know he was 2 years younger than Nathaniel. The laughter could be heard blocks away as they squealed in excitement. Playing ball was another favorite of Brayden's. Any type of ball, and size, in any place... if there was a ball to be found, Brayden would make a game of it. Brayden loved music. He would grin and dance to whatever beat he heard. One of our favorite memories was during worship at church. Brayden would sit up on Daddy's chest, clap his hands and sway back and forth, smiling ear to ear. He was truly such a happy and loving baby...a joy to his grandparents, cousins, friends, and even his teachers loved having him in class. 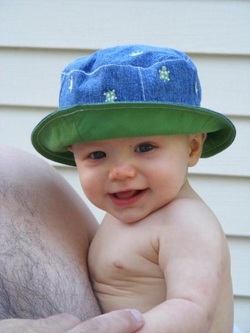 On June 6, 2008, our precious Brayden was taken to Heaven at 17 months old. As a very sick, pregnant mommy, all I could do was lie around that day... when I wasn't in the bathroom. Brayden and Nathaniel had been playing together so nicely all day. In an instant, the two boys slipped out the back door to go play in the yard without being noticed. Immediately, when we realized they were not around, we began to search for them. As the back door was opened we were hit with the reality that Brayden was in the pool. CPR was started until EMS arrived, and the team took over. It was too late... they did all they could do, but it wasn't enough. Our world was shattered as we tried to comprehend that our baby boy was gone. Six months later we were blessed again with our daughter, Elliana. It was a bittersweet time, but she gave us joy. The journey over the last two years has been long and hard. There are still many tears and sad moments, yet through the support, prayers and encouragement of friends and family we have found the strength to carry on. We recently began self-rescue swim lessons with our two children. It has opened our eyes to so much and shown us the importance of promoting water safety. It is our desire to prevent others from having to experience what we have had to endure. Each and every child needs to know the dangers of water and learn to never go near water alone. Not only do they need to know how to swim, but they also need important skills to save themselves. Through education, awareness, water safety tips and networking, we will strive to make it so that not another loved one drowns. To follow more of our Journey visit www.braydenzieg.com for Michelle's Memorial Blog.